How Do You Wash Denim or Jeans Garments? Denim washing is the aesthetic finish, which is given to the denim fabric to enhance the appeal and to provide strength. 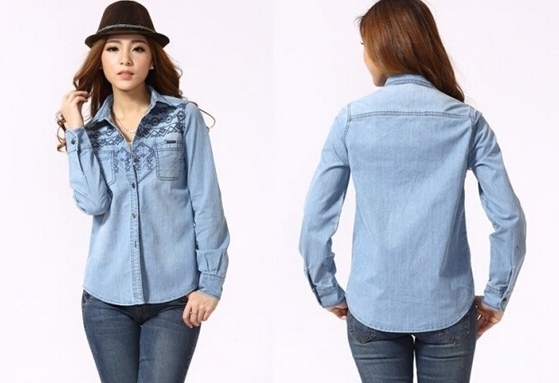 In case of denim washing, several wash effects can be produced such as- color fading with or without patchiness, seam puckering, de-pilling, crinkles, hairiness etc. But denim washing follows a process flow-chart, by which all the mentioned effects can be achieved easily. As its importance in garments washing, the whole process flowchart of denim washing have discussed in this article. Firstly, denim garments should receive from the sewing department. If garments needed any types of dry process (Hand-sand, whisker, tacking etc), then it’s sent to the dry process section to do that. After completing required dry processes, garments sent to the wet process section. Garments are loaded into washing machine to complete the garments washing processes followed by the buyers approved wash reference. De-sizing process is done here by using de-size chemical to remove size material from the garments. According to buyers provided wash reference, enzyme washing process is done here by using enzyme chemical (Acid enzyme or Neutral enzyme). According to wash reference, If bleaching process is needed to match with the desired shade then it’s done here by using bleaching chemical (K.C.I or Japani Bleach). Bleaching chemical should be neutral here by using sodium meta bi-sulphite or sodium hypo. Each chemical choice depends on the instant situation of garments. Here, garments are extracted by using hydro extractor. Garments are dried here by using gas dryer or steam dryer. According to wash instruction, if garments have needed P.P effect, then P.P should be done here by using required chemical. Here, P.P chemical have to neutral by using sodium meta bi-sulphite. Sometimes, tinting is needed for matching with the required shade. This process is done here by using softening chemical. Its may be cationic or non-ionic softener. Garments are extracted here by using hydro extractor machine. Here, all the garments are dried by using gas dryer or steam dryer. According to buyers approved wash reference, if garments needed 3D effect then 3D process is done here. After applying 3D process, all the garments are cured here by using woven machine. All the garments are checked here by maintaining buyers approved wash reference sample or shade band. Finally garments sent to the finishing department.